Toronto – Odon Wagner Contemporary announces the opening of Illuminated Landscapes, an exhibition of new paintings by American artist Don Resnick. The conceptualization of nature leads sometimes to paradoxical conclusions, yet the relationship between man and his natural environment continues to be one that many artists strive to navigate. Don Resnick is one such artist who explores the expressive possibilities of landscape, and his oeuvre, spanning fifty years, reflects the very crux of the matter: that landscape is an ever-shifting, elusive construct. It has been the object of contemplation for as long as humans have been able to articulate their own subjectivity, and Resnick upholds the artistic tradition of granting the landscape aesthetic primacy. Landscape painting is a genre that only the bravest still pursue, and Resnick makes a strong argument for the appropriateness of the medium in conveying to the viewer the tactility, sensuousness, and dynamism of nature. The works in this exhibition convey to the viewer Resnick's ardent faith in the restorative qualities of resting one's eyes on a scene that demands very little in return. We are granted a glimpse of Resnick's private moments, where he shares his personal experience of the land from which he gains so much fulfillment. If we acquire a new perspective on nature through nuances of light and space, or are even just reminded of its need for future protection, then Resnick is pleased. Ultimately, Resnick speaks to the mythic tradition of landscape, the idea that we are collectively defined by our environment; our habitus is rooted in this space; a notion that many take for granted—we cannot see the forest for the trees. Resnick takes pause, engages in the simple act of looking, and reminds us what we stand to miss in the lush, tranquil sublimity of the wilderness beyond the city. Light is a principal element in Resnick's work, and the ephemeral qualities of the sun's diluted rays upon the contours of land guide the viewer though the composition. In Coastal Path, we are dwarfed in comparison to the cluster of trees that stand before us. Patches of light illuminate the ground and create a visual path up, around, and finally down to the waters that lie below. Instantly, we are reminded of the Impressionists' studies of light—its fluid, transient qualities—and their unprecedented technique of using a multitude of pigments to record the atmospheric energy of their surroundings. Uniquely, Resnick's painterly strokes suggest his own presence in the scene—we get a sense of his reaction to what lay before him and witness how that is translated into the vast expanse of colour and texture before us. His deft, masterful brushwork creates a luminous transparency often achieved through watercolour techniques, and he works 'alla prima' to ensure that his canvases remain lucid and buoyant. Resnick works largely from memory and trusts instinct over concrete details of place. His spontaneous working methodology is what allows for such intensity of spirit in his painting. 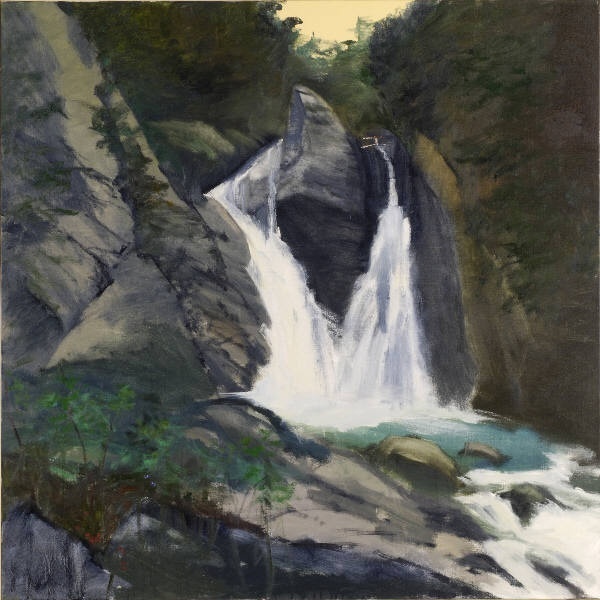 Resnick makes his preliminary sketches en plein air and uses those sketches in his studio, where he works in oils to capture that moment of inspiration from memory. Art historian Simon Schama comments that landscape can only be a human construct—it is a product of our culture, and exists in tandem with us. He notes that landscape is essentially a manifestation of the mind, and its scenery depends on our recollections of it as much as on geological formation. Since the formation of the word 'landschap,' by the Dutch in the sixteenth century, landscape came to reflect nature as mediated by human vision. With this in mind, it becomes clear that Resnick's work is in fact a response to nature, and not a utopian attempt to recreate nature. Resnick's practice recalls the Romantic tradition of understanding landscape as a vehicle for exploring our own emotional depths, and Damariscotta Lake is one such example where we are reminded of this fact. We survey a scene that extends magnificently into the distance, where the horizon meets the sky and embraces the coral light offered by the retreating sun. This "wreath of glory" illuminates the fields before us, and we cannot help but feel as if we have stumbled onto this vision at the most perfect moment. The sky is reminiscent of Turner or Constable, but we are sharing a scene that only Resnick could provide us with—we are allowed to meditate on a vision that is so personal yet speaks to something greater, more universal. Resnick uses the intimacy of place to articulate the powers of space. There is a tranquil solitude that connects Resnick's works, and he refrains from placing any figures within his compositions. Understanding that a figure immediately calls attention to itself, detracting from the setting in which he or she is placed, Resnick chooses, for the present, to emphasize the abstract qualities of the land over those who might inhabit it. We are given only traces of human presence, through a cabin in the periphery or a cottage nestled into the shoreline—never do they encroach on the scenery. In Moonlight Toward Pemaquid, one of Resnick's arresting nightscapes, we take note of a light flickering across the bay, but remain transfixed by the ethereal glow of the moon. To stand before this work is a mesmerizing experience. One shudders in anticipation of the slight chill in the air as the waves gently lap against the rocks at our feet. Falling into synch with our own breath, our own corporeality, we attempt to digest this visual feast. For more information about Don Resnick's oil paintings, works on paper and serigraphs please contact the gallery curator at rafael@odonwagnergallery.com or by phone at +1 (416) 962-0438. To view the available collection of Don Resnick’s artworks at Odon Wagner Contemporary please CLICK HERE (you will be redirected to another page on this website).